Jesus came that we might have life – abundant, bountiful, plentiful life. But are we living it? 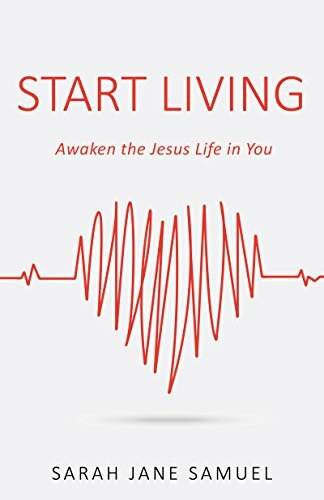 In Start Living Sarah Jane highlights twelve principles that will help you live life the way God intended. And much more, inside the pages of this stirring paperback! If you want to live life to the fullest, then this book is a must-read for you. Born and raised in southern India, Sarah Jane left home at the young age of seventeen to pursue her higher education in Curacao, and shortly thereafter in the United States. Her book is a result of the journey of lessons she has learned over the years – lessons of trust, surrender, and constant dependence on Jesus. Today, along with her husband, she is the co-founder of Destiny Point Ministries, and they reside in Fort Worth, TX with their two beautiful children who love Texas cuisine, the Dallas Cowboys, and rare escapes to the Gulf Coast.